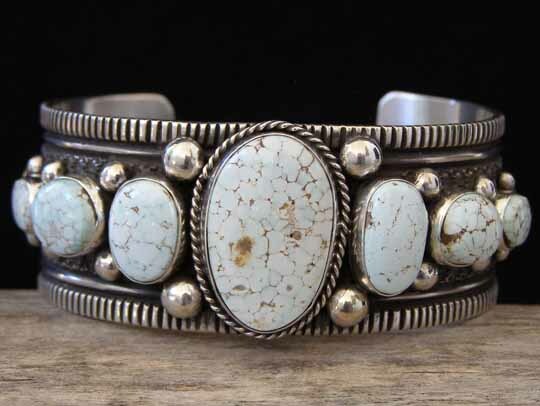 Guy Hoskie Dry Creek Turquoise Graduated Row Bracelet size 6 3/8"
This uniform-width graduated row bracelet is set with seven stones of natural, untreated Dry Creek turquoise stones from Nevada. The stones are set in smooth bezels and raindrops are interspersed between the stone sets. Deep-stamped traditional stampwork further decorates and highlights this uniform-width cuff. The silverwork has a nice patina which gives it an old-style look. Guy's hallmark consists of his initials G and H with the word Sterling stamped between the letters of his initials. Stones: center 15/16" x 5/8"; 2 ovals 1/2" x 3/8"; 2 ovals 7/16" x 3/8"; 2 ovals 5/16" x 1/4"